I admire Apple since the year 2000 when I first watched the video of PowerBook. I then kept following Apple's progress ever since. I was amazed with the iMac Sun Flower. It had got me more curious about the man behind the products. Then I watched the Mac vs PC commercial on the web in 2001. It'd got me!! Apple was serious in their products. Even though some people found it funny, I found it insane!! (in positive way). Then Apple launched the first iPod. I liked it so much but I did not have enough anything to buy one. I could only see people walking around with white cables to their ears. I could only envy them. But I was fascinated by the progress of Apple. More and more products were launched in very short time... Wow! They are really crazy! I thought. Then I watched the movie, "Pirates of Silicon Valley". I was interested in the history of Apple Computer. Then they had them; iMac, iBook, MacBook, the G4 Cube, Apple TV, MacBook Pro, more iPods, xServe, Mac OS X Tiger, Panther, Leopard, Snow Leopard, Lion, MacBook Air, iPhone, iPad. Those are not just great products, if you noticed the design! I went, oh My God! There was no words would be able to describe them. The design is just insanely great! They are really crazy! Who behind all these insanely great things? Then I began to learn more deep about Steve ever since then and even more when I bought my first iPhone. I watched all of his keynote speeches, product launches, Macworld, WWDC, Special Events, Interviews, etc. 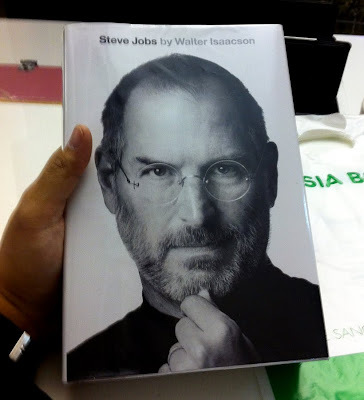 I also read articles and books about him, before then I read his last biography, "Steve Jobs". He was my idol, my icon and my inspiration, the true Human Earth. I see the world differenty after knowing his life story. Thank you Steve for make a difference to the world. I will remember him forever. Rest in Peace, Steve. "Here's to the crazy ones"
"Let's put a dent in the universe"
The following is the Apple's ad which aired on TV in 1997 when Steve returned to Apple. Apple did not have many products to show back then. So this ad was more for the employees of Apple. Now you can see and hear his message with his own voice, not just for Apple, but for us all. "Here's to the Crazy Ones". "Here's to the Crazy Ones. The misfits. The rebels. The trouble-makers. You can quote them, disagree with them, glorify, or vilify them. About the only thing you can't do is ignore them. Because the people who are crazy enough to think they can change the world - are the ones who do"
The video below was taken from the event took place at Apple's Headquarter in Cupertino, to celebrate Steve's life. Tears to my eyes every time I watch it. ‎"I like to think that something survives after you die. It's strange to think that you accumulate all this experience, and maybe a little wisdom, and it just goes away. So I really believe that something survives, and that maybe your consciousness endures." "But on the other hand, perhaps it's like an on-off switch. 'Click!' And you're gone."